You are here:Home Articles What should I be learning in my singing lessons? By now you have hopefully started taking regular singing lessons, and are practising every day, working towards a balanced voice. But what should you actually be learning in singing lessons? Let’s take a look so you can get the most value, financially and vocally, from your lessons. A good singing teacher, using a solid technique or vocal pedagogy, will be able to show you how to sing in all parts of your voice with an even, connected tone, not just your head or chest voice. To have the voice you want, you need to be learning how to move from the bottom of your range to the top without any strain or breaks, or changes in quality or tone. If the teacher you’re working with doesn’t do this, then ask them to do it. You’re paying for the lessons, so you need to make sure you are getting what you want from it. If they don’t know how to do it, then it may be time to find a technique teacher rather than a style coach! We’ve talked about a balanced voice plenty of times before, but its worth reiterating it. To sing freely, with power, agility, and stamina you need a balanced vocal technique in your sound production. If you don’t sing with a balanced vocal technique, you run the risk of…..
……to name but a few problems! A good singing teacher should be able to demonstrate a balanced vocal technique and then give you the tools you need to find that in your own voice. Most importantly, balanced vocal technique is NOT just about breathing. In fact a lot of the time, your breathing is just fine and the problem is with your vocal function. If your teacher is not helping you with vocal function (what is happening at your vocal cords) then you aren’t going to get anywhere. 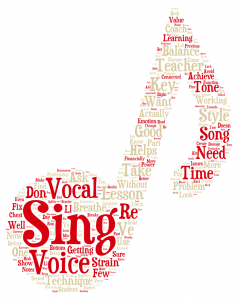 Let’s face it – if you had problems with your breathing, then you wouldn’t be consulting a singing teacher, would you? If your teacher is spending more time “helping you to breathe properly” than actually helping you achieve a balanced voice, then it might be time to look elsewhere. In the past few years I’ve had quite a few students who come to me from teachers who don’t teach any vocal technique at all. Their previous lessons consisted of some breathing exercises, and then working through songs. One of the most extreme examples of this is a female student who was suffering from not being able to sing in the bottom of her voice properly, her chest voice. Her previous teacher gave her the Italian song “O mio Babbino Caro” to sing, and when she couldn’t hit the high notes, the teacher transposed the key down by six semitones! Really?! Rather than fixing the problem, the teacher just avoided it by changing the key. You can bet that 40 minutes into the lesson with me, this student was blown away when she sang the song in the original key without any trouble at all. A second example is a male singer, who was told he should “sing in the masque” more. His lessons also consisted of working on his breathing and then being taken through songs where the keys were lowered. As I said to him, if you knew how to “sing in the masque”, why would you need singing lessons? This type of lesson is purely just about singing songs; there is nothing that helps you to fix cracks or straining in in your voice. You can probably call these teachers style or repertoire coaches, rather than singing technique teachers, because they are not actually teaching you how to sing. Style and emotion are a huge part of singing and performing, and as such are very important components of the song. However, if you can’t reach half of the notes in the song without the veins popping in your neck, then it doesn’t matter how emotional your performance is. You won’t be able to sing for very long, because you’ll more than likely end up with vocal damage. Balanced singing technique is the foundation to which you add style and emotion, not the other way around. As Certified IVA Instructors, Laura and I are both trained in vocal technique and know how to achieve balance in your voice, as well as helping with performance and style coaching. We both use the technique for our own voices, so you can be sure that when we ask you to do something, one of us will have done it before in our own voice. Chances are, we’ve been where you are right now, vocally speaking! So if you are serious about your voice, take a moment and think about the singing lessons you are having. Ask yourself “Is my voice getting better, or am I just learning to avoid the problems?” This is so important, because everyone deserves the right to be able to sing well. If you are putting time and money into your voice, then you want the most value for it, not just financially but vocally as well. If you’re in any doubt about whether your voice is getting better, come and take a trial lesson from one of us. We’ll show you how effective a good technique can be for your voice, so email us, or pop us a message from the enquiry form.